Need signs in the Birmingham area? 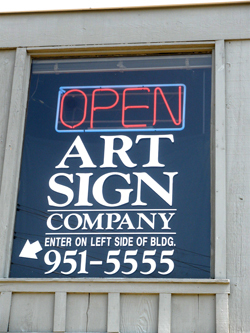 Art Sign Co, established in 1940 and run by Larry Rocks since 1990, offers you years of sign industry experience. Whether you need banners, storefront signs, truck or vehicle lettering, sidewalk signs, 3d plastic letters for walls, or window lettering — and much more — we offer quick turnaround, Monday through Friday. Call us today! Come visit us to discuss your sign. U.S. 20 East exits at our doorstep (Exit 133). Many signs today are cluttered themselves — the product of hi-tech printer technology getting the better of designers. Not so at Art Sign! We always keep the viewer — your potential customer — in mind, so your message shouts out loud and clear amid all the noise. Check out some of our favorite websites! These hand-lettered trucks and buildings from the 1930s, 40s, 50s and 60s will momentarily transport you to a different time — click here for a visit to yesteryear.